THE BARBET REVEALED. Getting under the curls of the ancient French water dog. Winner of the International Book Award 2015. Order the book here! A complete guide for the barbet lover! The Barbet Revealed is a complete guide filled with information and tips about the grooming, upbringing and training of a barbet. The book takes its starting point in the breed Barbet but is very useful for all dog owners. It is written to inform anyone who is considering buying a barbet in making the right choice of breed, but also to provide barbet owners with useful information about how to make the most out of their barbet life. Throughout the book you will find beautiful and illustrative photos of barbets from all over the world. 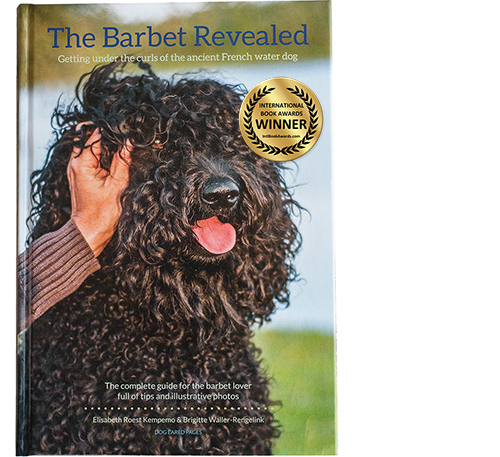 In short – an indispensable, fantastic book that will teach you all there is to know about the barbet but also a book to continue enjoying glancing in, that presents our amazing barbet breed in all its glory! The book is available in English and Dutch. It is shipped from Holland and can be sent to any country. If your country is not in the list send us a mail at info@dogearedpages.nl and we will add it.